Stoneridge MirrorEye™ CMS is the only FMCSA exempted* driver vision system that replaces a truck’s mirrors with integrated external digital cameras and digital monitors inside the cab of the truck. 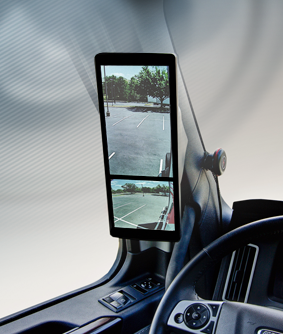 This provides the driver with a more complete view of operating conditions over traditional mirrors. Dependable design — Independent video processing of multiple camera images ensures that in the unlikely event of an individual camera failure, the other camera images continue to be displayed. Real-time images are continuously displayed without interruption. Augmented and enhanced vision quality — High-definition digital cameras provide greater fields of view, including color night vision, low light sensitivity, glare reduction, superior views in inclement weather and trailer panning capabilities. Advanced trailer panning — The CMS automatically tracks the end of the trailer to keep it in view while the vehicle is moving forward. This feature could eliminate right-hand turn collisions with motorists and pedestrians. Reduced fuel consumption from aerodynamic design — Removing mirrors during fleet trials and in European trucks has demonstrated a fuel cost savings of roughly two to three percent per year, which in addition to the significant safety benefits, can also improve the operator’s bottom line. 24/7 roadside support — 24/7 roadside support offer drivers peace of mind in the unlikely occurrence of a multi-camera failure or vision obstruction. *MirrorEye is the only federally approved CMS that allows for complete removal of traditional mirrors in the United States, as exempted by the Federal Motor Carrier Safety Administration [Read more]. The system is available for aftermarket and retrofit truck installation in the United States. Stay tuned for news and announcements at www.Stoneridge.com/media. To learn more about Stoneridge’s European MirrorEye system for bus and coach, please click here.